The Norwegian Port of Drammen has opted for a new Liebherr mobile harbour crane, Liebherr LHM 550, which has started operation in June 2014. This is the second mobile harbour crane for the port, the other being an LHM 400 in operation since 2008. With this new investment, Port of Drammen has doubled its container handling capacity. Additionally, the Liebherr LHM 550 is also capable of efficient bulk, general cargo and heavy lift operation. 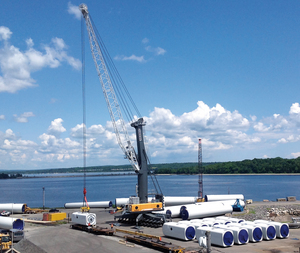 Liebherr LHM 550 provides a lifting capacity of 144 tonnes, which means over 40 tonnes more than the strongest of the existing machines in the port. The new crane is equipped with Liebherr’s Pactronic hybrid drive system, achieving increased handling performance with reduced fuel consumption. The LHM 550 is designed for versatile and efficient cargo handling up to post-panamax-sized vessels. A maximum lifting capacity of 144 tonnes (depending on winch configuration) and 54 m max. radius make the LHM 550 the right solution for all cargo handling needs i.e. containers, general cargoes, bulk materials or heavy lifts.